Elias Eddy Contributed to this article. Conservative Charlie Kirk, founder of Turning Point USA, spoke Tuesday night at the University of Central Florida, attracting a heavy police presence and protestors. An hour before the event started, Julia Turner, a Political Science major and treasurer of UCF’s Turning Point chapter, gave out flyers for Kirk’s event, encouraging passersby to attend. While giving out the flyers, Turner received mixed responses from from those she able to to talk to. “The ones that agree are going to cheer you on, the ones that don’t agree are going to roll their eyes, [and] kind of walk away,” Turner said. While the initial Facebook protest event created by OWL said that 130 were interested in attending, a group of nearly 10 protesters stood outside of the Psychology building, yards away from where Turner was handing out flyers. Thomas Hellinger, a 2014 UCF Alumnus and Democratic Socialist, said that he “generally loathed” Kirk. “I do not approve of his values,” Hellinger said. 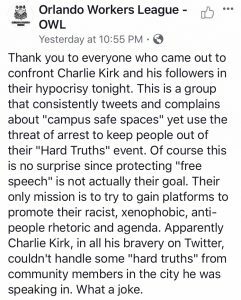 While he felt Kirk had the right to speak, he didn’t feel that UCF should have given him the platform to speak. UCF Police officers could be seen posted at the entrances to the building, as well as patrolling on foot and by bicycle. In addition to the heavy police presence, a metal detector was installed outside of the entrance to the speaking event, along with a poster featuring a list of banned items in the venue, such as umbrellas, bags, purses and clutches, water bottles, and tobacco products. A group of protestors were not allowed entry to the event, according to the Orlando Worker’s League facebook page. A cell phone video was posted, showing the confrontation between protesters and security, along with a paragraph condemning Kirk and his followers for not allowing them into the event. The event started shortly after 7 p.m. Cristina Del Rosso, the president of UCF’s chapter of TPUSA, opened the event by stating the rules and regulations, including the forbidding of any violent outbursts or verbal interruptions. Kirk spoke uninterrupted for 45 minutes, and then allowed an open forum for questions and debates. 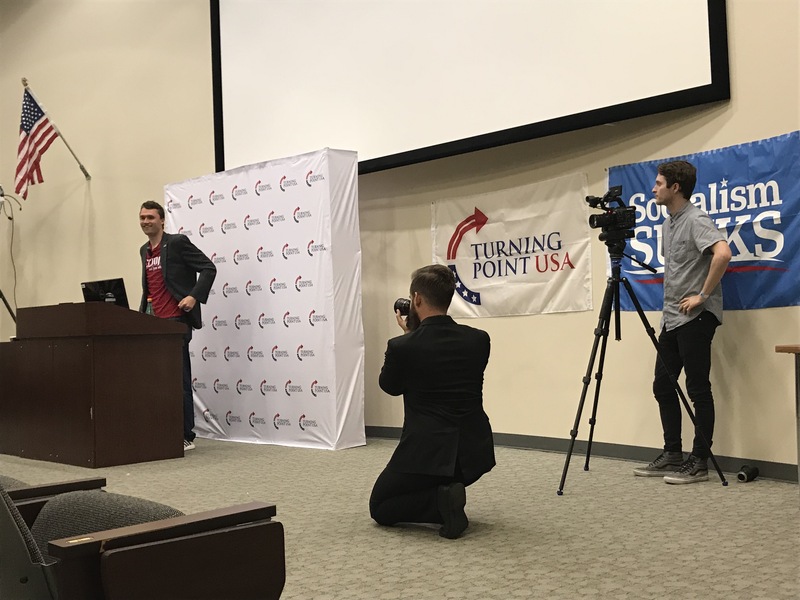 He touched on topics ranging from modern feminism to 9/11, making statements such as “modern feminism is more about attacking men than empowering women,” “humans are inherently bad, and broken creatures” and “taxation is theft,” all of which were met by applause from the audience. Kirk said he would “stay all night” and talk to the audience if he were to be allowed. The open forum during the second half gave the audience a chance to respond to Kirk’s arguments. He declared that those who disagree with him should be allowed to the front of the line. Though several in attendance said they disagreed with Kirk’s views, they stated upon concluding their questions that they had “respect” for Kirk, and were “pleasantly surprised” with the things that Kirk said.